A family home for a couple, of different ethnic backgrounds, which was one of the first to be built on the new Sentosa Cove residential development. A fusion of Eastern and Western influences provided an opportunity to celebrate the sameness and differences in the making of new home. 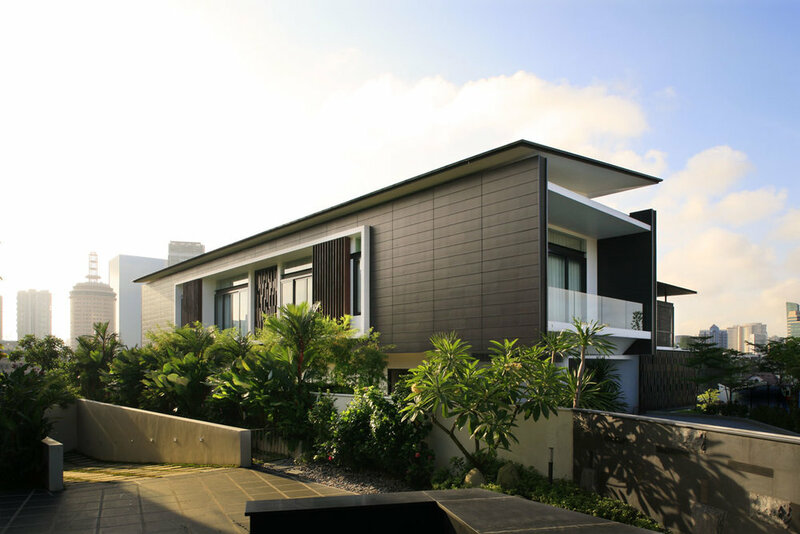 This interesting expectation of the Client in their new seaside home had to be moderated with Sentosa’s vision of resort housing typological guidelines. Guidelines had to be challenged and interpreted. E.g. what is an earth-tone coloured roof material, why should the carpark be at a right angle to the entrance, sacrificing precious garden space, and the setback distance from the seafront which controlled the extent of the swimming pool etc. A bipartite division of the form is an almost natural reaction to the 50% pitch roof requirements set by Sentosa Cove Development. Our design exploits this bipartite form and zonal division. The entrance to the house is placed in the centre with a direct view to the sea on the longitudinal axis. Functional rooms are organized along this visual corridor. One of the volumes explores a sculptural treatment of the pitch roof requirement by aligning its apex diagonally. This strategic move immediately dissolves the traditional reading of a typical pitch roof typology and elevates it to a dynamic and sculptural folded form of an abstracted stealth winged fighter jet. The other volume features a grounded rectilinear form with a floating and suspended glass volume within which serves as the Owner’s study. This floats over a double volume Living area overlooking the sea. This dwelling combines the spatial openness of seaside living with the necessary privacy needed by a young family.